The Guide to Get Rich: Three Concepts to Take a Company From Good to Great! Three Concepts to Take a Company From Good to Great! 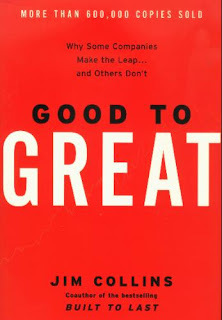 The book of the week was Good to Great by Jim Collins. This is considered a "must read" by most of the professors I have had. I think the book was pretty good. I definitely think it was a little harder to get through than most books, but that is because all the evidence in the book is backed up by cold hard facts. I would say the reading of this book is in between a business textbook and a motivational how-to book. The book lays out a pattern of companies that made the jump from being a good company to a great company. Collins follows 11 good-to-great companies and 11 comparison companies. He noticed a pattern in companies that made it to good-to-great status. They all have certain attributes: Disciplined people, disciplined thought, and disciplined action. After reading I decided that there are three ideas that are very important to achieving a successful business. 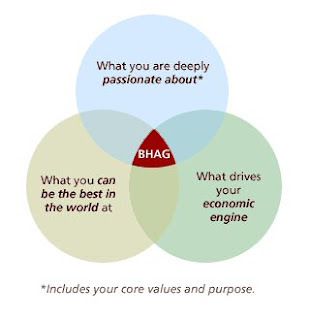 Level 5 leadership, the Hedgehog Concept, and BHAG (Big Huge Audacious Goals.) If you have these ideas at the base of your organization, you are well on your way to success. The first is Level 5 leadership, the book definition is: Builds enduring greatness through a paradoxical blend of personal humility and professional will. Most people never make it to this stage in their leadership and if you think you are a level 5 leader... you're not. Part of being a level 5 leader is having the ability to step back from the limelight and look at what is best for the company, no matter what. Most people don't even know of level 5 leaders because they aren't the ones getting the credit. They are more concerned with taking the company to where it needs to go than to get credit for it. Most of the time they credit successes to those around them and throw blame to themselves for all the failures. Although these people are a needle in a haystack, you get one and you are well on your way to greatness. The next idea is the Hedgehog Concept. I love this one. You put your focus on three areas... what you are passionate about, what generates your revenue, and what you are best at. This makes up the three circles of the Hedgehog Concept. If you take those three circles and focus on where they overlap, you have your hedgehog. Just imagine, everyone at a company being passionate about what they do, being great at it, and generating revenue the whole time. Putting all those ideas together just sounds amazing. Another idea I wanted to throw at you is BHAG. It sounds simple, but most people don't know how to make their Big Huge Audacious Goals effective. They get focused on things they aren't good at just because it seems like a good idea at the time. The way to focus your BHAG is to look back toward the Hedgehog. The place where your three circles intersect is where you do you goal setting. If a company can couple the Hedgehog and BHAG with a Level 5 Leader, I can't imagine it failing. It would have incredible controlled growth doing things that matter for the people that work there. If I ever start a company, I will make sure that I implement these concepts. And I really don't think I will ever get to be a level 5 leader, but I know that if I ever find one, I will hold onto him or her and we will do great things together. I do want to say that Collins talks about companies rushing into things too quick. When making a company great, it takes time. Most of these companies did it over the span of several years. Rushing into things is a sure way to get in over your head and not make the jump to greatness. I think this book is very good and also very informative. There is so much information on this book I could write for pages and not even touch some of the material. Seriously, Jim Collins and his research team worked on this for 5 years! Not something I can sum up in a few paragraph review. And I think the book has very powerful information that is invaluable to any entrepreneur or manager. However, I don't think it is for everyone. This book would seem a lot like studying for a lot of people, especially if you are not particularly concerned with the ideas behind making a organization great. But if you do read this, go in with an open mind and think about how you might be able to incorporate the material into your personal life. If you have any questions on the book don't hesitate to ask me a question. I would be more than happy to help anyone that needs it.